Minimum quantity for "Morny Nature's Aloe Vera Moisturising Cream (300 ml)" is 0. Maximum quantity for "Morny Nature's Aloe Vera Moisturising Cream (300 ml)" is 0. Morny Nature's Aloe Vera Moisturising Cream contains healing and restorative Aloe Vera for optimum hydration of the skin. Perfect for dry, aged and sun damaged skin. A classic, sumptuous moisturising cream, specially formulated with natural extract of aloe vera, which will condition your skin leaving it feeling soft and refreshed. Great for use after skin exposure to the sun due to its natural cooling properties. 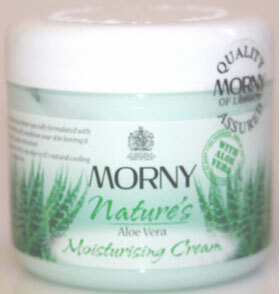 Apply Morny Nature's Aloe Vera Moisturising Cream liberally over the body, hands and feet.